Dojo History – The dojo was founded by the late Tasshi Jim Logue (1947-2011), in Barnwell, South Carolina. Jim Logue (1947-2011) – Below are excerpts from an interview with Jim Logue, from June of 2010, conducted by Matthew Apsokardu for the website Ikigai Way. In these sections, Tasshi Logue describes his meeting and early training with Seiyu Oyata. MA refers to Matthew Apsokardu and JL refers to Jim Logue. MA: I understand that in 1969 you were stationed in Makiminato, Okinawa. Could you describe a little bit about your military background and how it brought you to the island? JL: On July 3, 1968, I was inducted into the United States Army. This was at the height of the Vietnam War and everything was geared toward support of that. After completing basic and advanced training, I received orders for Okinawa. This was a bit unusual because most of the troops were sent to Vietnam or to Germany. To me, this was an act of fate. I truly wanted to find some place to learn martial arts and now I was being sent to the birth place of karate. 90% of all those completing advanced training at Fort Jackson, SC were sent to Germany or Vietnam. In my class, we had two that went to Korea and 4 of us went to Okinawa. I arrived in Okinawa on December 24,1968 and was stationed at the 2nd Logistics Command, the largest supply depot for the Army in the pacific theater. The US Air Force also had the largest air base in support of Vietnam at Kadena where B52 bombers flew their missions to Vietnam daily. The Marines were located mostly in the Northern part of the island except for Futenma Marine Station located just north of Makiminato. At the time I was stationed in Okinawa, it was still under American administration and the overall command of the local government was under the US commissioner. All monetary exchange was in US dollars and the road system, electricity was just as it was in the US. MA: Did you study at multiple schools on Okinawa or did you find Seiyu Oyata Sensei right away? What was your first meeting with Oyata like? JL: After arriving in Okinawa, I immediately set out to find a dojo. The base where I worked was just about Naha, Okinawa’s capital. By cab, it only took 15 or 20 minutes to get down town, so I began my search there. I first came across Nagamine, Shoshin’s dojo in Naha. I stopped in for a visit, but even though by today’s standards it wasn’t that far away, my meager Army salary didn’t afford me enough money to pay for cabs to and from the dojo. Nakazato, Shugoro’s dojo located in Aji was a little closer to the base, but I had brought my wife, Sherry over and we were living on the opposite side of the base. Again, the expense of the cab rides precluded me from training there. During lunch break at work, I went outside to play catch with some of the local workers who all loved baseball, I noticed a fellow serviceman practicing a kata. I asked him where he was training, hoping that we could perhaps share the cab fare. He explained that he walked from the base to the dojo and pointed into the direction that I lived. I met him that night and he took me to Oyata Sensei’s dojo. As it turned out, the dojo was in the village next to where I was living. The dojo was literally two blocks away! The small cinder block building could have been easily overlooked except for a sign in front of the dojo. Of course it was written in Japanese, but I easily recognized the characters for karate. The class consisted of several other GIs, some dependent teenagers and some Okinawan students. I was approached by the dependent teenagers, who were part Okinawan and part American. They were fluent in both Japanese and English. Oyata sensei spoke to me through them. I was invited to come in and sit to watch a class. After a few minutes, I asked about the fees and class schedule. As explained to me, classes were every day, seven days a week. I could come every day or as often as I would like for a fee of six dollars a month. I could not get my wallet out fast enough to pay my first dues. My first class, the next day, consisted of standing in a horse stance doing a blocking and punching drill. Oyata Sensei had one of his Okinawan black belt students teach me. Neither of us could communicate verbally since I didn’t speak Japanese and he didn’t speak English. I had to visually follow his instruction. This type of instruction continued for several weeks and then I was introduced to Bogu Kumite. I was much taller than anyone else in the dojo, so I was chosen by all of the Okinawans to spare. Of course, I didn’t fair too well against them, but I was learning a lot through this experience. After about a month of training, I was told there would be a demonstration on the base where I worked. Through the translator, I was told to emcee the demonstration since I didn’t have enough experience to be a part of the demo. This seemed really strange to me as there were many with much more experience that would do a much better job. As the dojo practiced for the demo, Oyata Sensei began to explain to me in broken English and through his translators what he wanted me to explain during the demo. He also instructed me to buy and wear a brown belt during the demo. He didn’t think a white belt would be well-received as a spokesman for the dojo. The next day after the demo was as different as night and day for me. Suddenly, Oyata sensei was talking to me directly, no longer using the translators and he also began teaching me directly. I guess this must have been some sort of test and that I had done well enough for him to trust me. MA: What was your training like on Okinawa? Could you describe some of the conditions and methods used (for example: focus on kata, hojo undo, sparring, kyusho, etc). Was most of the training done on base or in the dojo? JL: The training in Okinawa was a mix of a lot of things. First, there were drills aimed at teaching proper defensive covers, then came kata training. A heavy kick bag was used for kicking and punching mostly used in the bogu matches. There was makiwara training and occasional exercise to develop strength and speed. Every day training included bogu fighting. Usually, before the night was over, you fought everyone in the dojo. Sometimes, after most of the class left, I was asked by Sensei to stay a little longer. 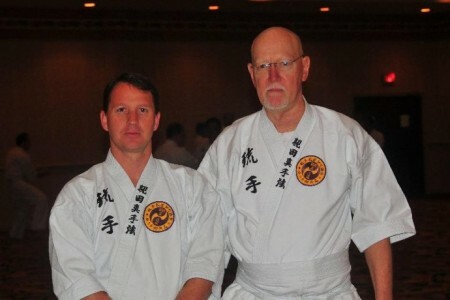 He worked with me privately on weapons fighting and finer points of kata. I wasn’t sure if he was treating me special or that he just needed someone to practice his techniques. At least once a month on the weekends, we’d travel to other dojos or they would come to ours for bogu fighting. It became a highlight of training for those of us who liked that sort of thing. We also held belt tests in conjunction with Toma Sensei’s dojo and would travel to Koza to his dojo. There, Uehara Sensei, Toma Sensei and Oyata Sensei all sat on the testing board. We were called individually to perform a kata or two and then paired for bogu. MA: Were there many cultural barriers to overcome in order to integrate into Okinawa and dojo life? Any communication difficulties? JL: At the time I was in Okinawa, it was still under American administration and many of the locals worked on the bases. Most of them could speak English and were used to the Americans. There was a large number of Military and US Civilian workers in Okinawa, so the locals were used to that. When I first started in the dojo, Sensei didn’t speak much English and some of the Okinawa students didn’t, but as I stated before, several dependent kids were fluent in both languages and there was no problem with communication. After a month of so there, I began to learn a little Japanese and Sensei began to speak English to me directly. I suppose it was probably more of an advantage, than disadvantage that my first lessons were in Japanese. I had to use my eyes to visually understand what I was being taught rather than having to hear the words and try to watch at the same time. The full interview can be found at ikigaiway.